The Suffolk County Legislature’s committees will meet in Riverhead this coming week. The Suffolk County Legislature will hold next week’s committee meetings in the Evans K. Griffing Legislative Auditorium in Riverhead. It is the first time in generations that committee meetings will be held in Riverhead. 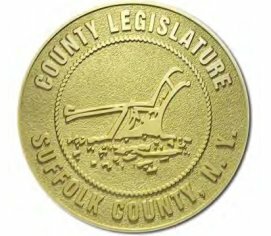 The change came at the request of First District Legislator Al Krupski and Second District Legislator Bridget Fleming, who argued that holding some committee meetings in Riverhead would make Suffolk County government more open and accessible for residents in the eastern portion of the county. Suffolk County Legislature Presiding Officer DuWayne Gregory agreed. Meetings scheduled for May 2-5 will be held in the Riverhead Legislative Auditorium in the Evans K. Griffing Building in the Suffolk County Center (300 Center Drive) in advance of the May 10 General Meeting, which will also be held in Riverhead. A full list of the committee meetings is online here. Click on the title to the committee to download meeting agendas. One other Committee Week cycle this year will be held in Riverhead, while the others will be held at the William H. Rogers Building in Hauppauge.